Tickets for the Death Magnetic launch party proved to be £5 well spent! 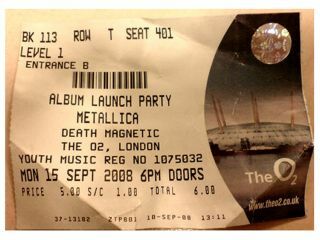 The day after playing one of their smallest gigs in years at the BBC Radio Theatre, Metallica rocked London's O2 Arena on 15 September 2008 with a set that drew heavily from their new album Death Magnetic as well as including an assortment of classics. Guitarist magazine's senior staff writer Rob Laing was on hand to witness a Metallica performance that proved beyond doubt that "27 years on from their formation this band have still got balls." Click here to read the full review of the O2 set on the Guitarist blog.